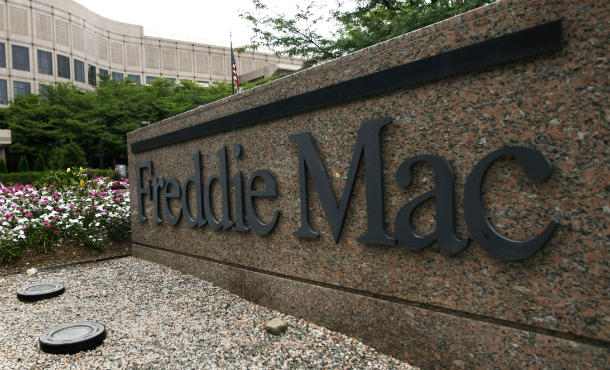 The $5 Trillion Question: What Should We Do with Fannie Mae and Freddie Mac? For decades America’s system of housing finance was the envy of the world. But reckless behavior on Wall Street and weak oversight in Washington during the 1990s and 2000s contributed to an unprecedented bubble and bust in the U.S. mortgage market, resulting in financial catastrophe by 2008. Among the casualties were government-backed mortgage financiers Fannie Mae and Freddie Mac, whose losses landed them in government conservatorship, and the private mortgage-backed securities market, which has been all but nonexistent since the crisis began. Nearly four years after the massive bank bailouts of 2008, more than 95 percent of all home loans are backed by Fannie Mae, Freddie Mac, or the Federal Housing Administration. The mortgage market remains on life support as investors have shown little appetite for purchasing mortgages without a government guarantee. Just about everyone agrees that the current level of government support is unsustainable in the long run and that private investors will eventually have to assume more risk in the mortgage market. That leaves two critical questions before policymakers today: What sort of presence should the federal government have in the future housing market? And how do we transition responsibly to this new system of housing finance? Since the conservatorship of Fannie and Freddie began, dozens of advocacy groups, academics, and industry stakeholders have offered possible answers to these questions. 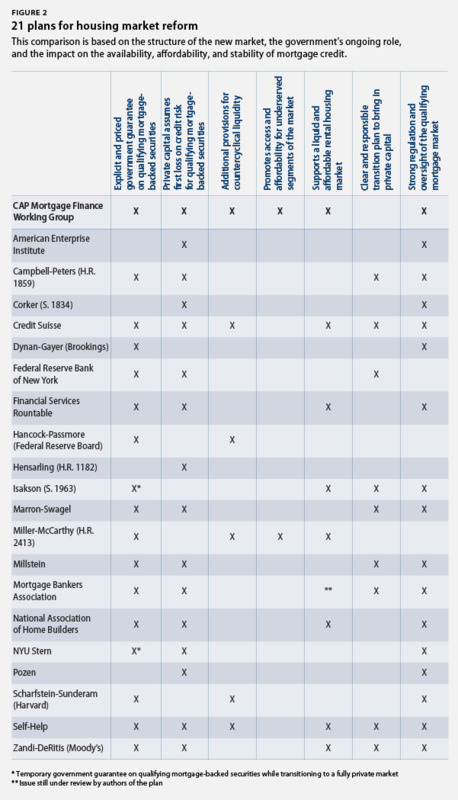 Below is a chart summarizing 21 plans aimed at overhauling the nation’s housing finance system. We analyzed each proposal’s market structure, government presence, and expected impact on the availability, affordability, and stability of mortgage credit. See summaries of all 21 plans in our user-friendly interactive here. But before we go into the details, it’s important to understand a bit about how the mortgage market operates today, what role Fannie and Freddie play in that market, and how we got into this mess in the first place. The primary function of Fannie Mae and Freddie Mac since their creation has been to provide liquidity to the nation’s mortgage finance system. Fannie Mae and Freddie Mac purchase home loans made by private firms, provided they meet strict size, credit, and underwriting standards; package them into mortgage-backed securities; and guarantee the timely payment of principal and interest on those securities to outside investors. Fannie and Freddie also hold some home loans in their own investment portfolios. Since mortgage lenders no longer have to hold these loans on their balance sheets, they have capital available to make more loans to creditworthy borrowers. Under this system, mortgage finance was continuously available well into the late 1990s under terms and at prices that made sustainable homeownership available to most American families. By the end of that decade, however, Wall Street had figured out how to purchase and securitize mortgages without needing Fannie and Freddie as intermediaries. As a consequence, Fannie and Freddie began to lose large chunks of market share to so-called “shadow banks”—private financial institutions such as Lehman Brothers and Bear Stearns that performed many of the core functions of banks but operated outside the regulated banking system. During the housing bubble, loan originators backed by this private capital began peddling large quantities of high-risk subprime mortgages with terms and features that drastically increased the chance of default. Many of those loans were predatory products, such as adjustable-rate mortgages with pricing gimmicks designed to encourage potential homeowners to borrow far more than they could manage. Wall Street firms in turn packaged these high-risk loans into securities, paid the credit rating agencies to bless them, and then passed them along to investors who were often unaware or misinformed of the underlying risks. It was the poor performance of those purely private, largely unregulated products—not those backed by Fannie and Freddie—that triggered the financial meltdown, according to the bipartisan Financial Crisis Inquiry Commission and other independent research. In an ill-fated effort to win back market share, however, Fannie and Freddie also made a few tragic mistakes. Starting in 2006 and through 2007, just as the housing bubble was reaching its peak, Fannie and Freddie increased their leverage and began investing in subprime securities that credit agencies incorrectly deemed low risk. Fannie and Freddie also significantly watered down underwriting standards on mortgages that they would purchase and securitize. Most telling for Fannie and Freddie, unlike most private investment firms, the companies were not diversified and thus had no other sources of income beyond mortgages, leaving them exposed to enormous losses when the market crashed. As a result of those losses, the Bush administration placed Fannie Mae and Freddie Mac into government conservatorship in September 2008, where they have remained, kept alive with taxpayer dollars. The two mortgage giants have so far required $188 billion in government support—money Fannie and Freddie are not expected to pay back anytime soon. They remain very large companies, owning or guaranteeing a combined $5 trillion in mortgage assets, about half of all outstanding home loans in the United States. As seen in the following summary, most serious plans for reform share at least three of these components: a limited and explicit government guarantee; a bigger role for private capital; and careful government oversight. As Congress and the Obama administration consider the best path forward in the coming months, these areas of broad consensus can help focus the debate. With the aforementioned benchmarks in mind, here’s how the CAP plan stacks up against other prominent proposals. You can compare the details with our interactive here, and a detailed summary of all 21 reform plans can be downloaded here. This comparison is based on the structure of the new market, the government’s ongoing role, and the impact on the availability, affordability, and stability of mortgage credit. John Griffith is a Policy Analyst with the Housing team at the Center for American Progress. Special thanks to David Min, Julia Gordon, Janneke Ratcliffe, David Sanchez, Geoff Minter, and Kerry Mitchell for their help with this project.